Yesterday I was manning the candy store, playing Candy Crush (I like to think of it as market research) when two young couples from Madison walked in. They were killing time as they waited for a table at Kusaka. One of the women casually mentioned that there was a rainbow outside. At this, I said “I’ll be right back” and ran out the door with my iPhone. As I fled, I heard one of them say, “Don’t worry, we won’t steal any candy.” Even though I had just met them, that seemed like sufficient reassurance. The rainbow was so perfectly hitting the center of the hill, that I couldn’t believe it. 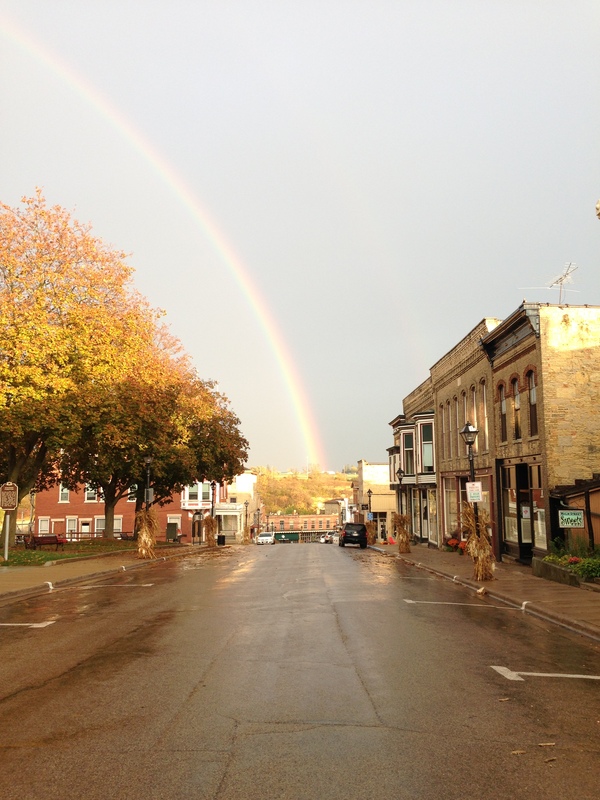 Mineral Point has a magical, other-worldly quality, which this rainbow seemed to capture. I realized the shot would be better the higher I went up High Street. So, I ran a little further up the middle of the street and took this picture. I would have kept going, but I didn’t want to completely abandon the store. Before heading back in, I took this 10-second video. I was tempted to say something during the video, but I kept thinking about the Complete Double Rainbow Guy. So, I kept my yap shut. When I returned to the store my customers didn’t treat me like a total nut job, for running out of the store and up the street. They bought some old-time candy and of course, some Skittles, which made the moment even sweeter. This entry was posted in Outdoors and tagged Lisa Hay, Mineral Point, Rainbow, Wisconsin. Bookmark the permalink. One of the things I really like about the people who come here is that they are very trustworthy. One time, I had run next door for something (can’t remember what right now) . When I got back, there was a lady in the shop who said “I didn’t know if I should answer your phone”. She was pleasantly surprised that anyone would leave their shop open while they ran next door. She said it was just another pleasant thing to remember Mineral Point by! 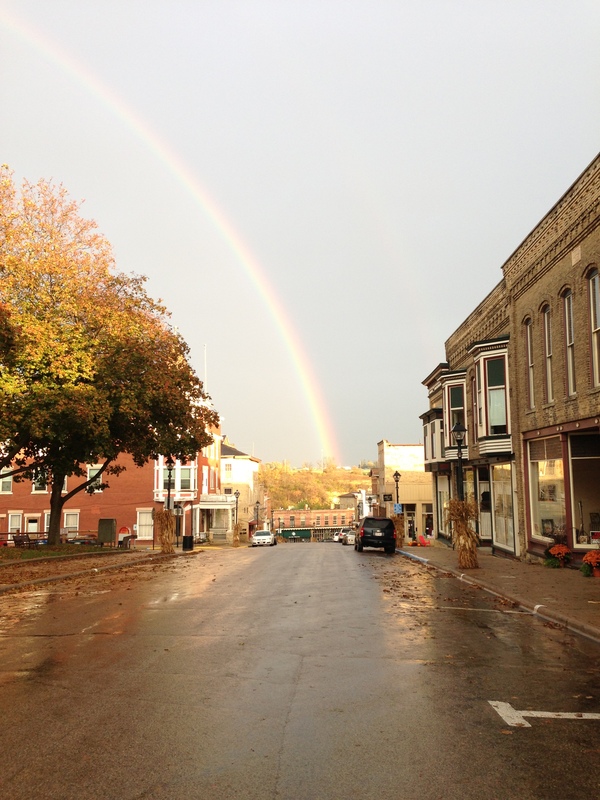 I remember the double rainbow guy and almost started shouting, “Oh my God, oh my God, a Mineral Point Rainbow.” But I was home alone, so no one would have appreciated it. Sorry I missed it, but you didn’t. Thanks. Fun posting on “the Beat” Lisa. I also enjoyed the story re: all the Mineral Point Homecoming Queens sighted around town. I need chocolate. 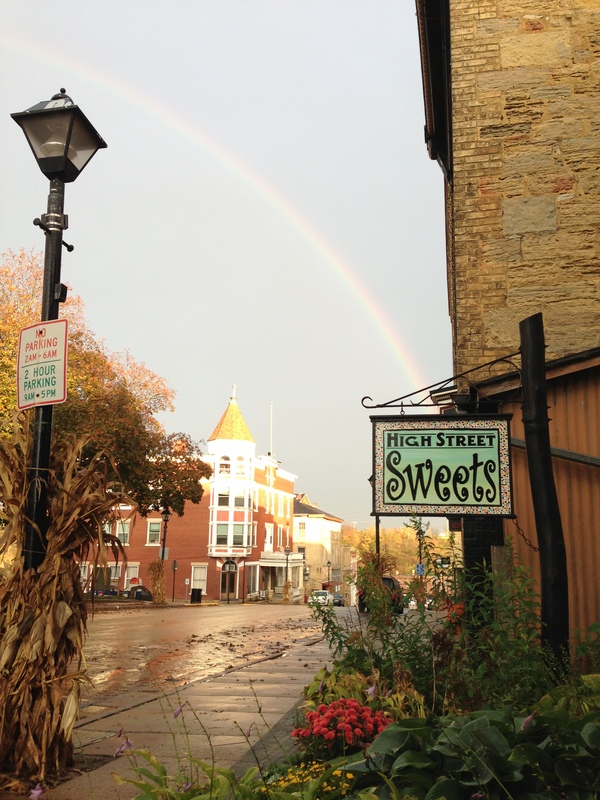 Lisa: you depicted “our town” beautifully, not only the rainbow, but the “sweet” excitement of the natural yet miraculous changes and blessings – if we only look UP. Many people who wonder why we are crazy about coming out so often have now seen another reason – though it does remain “indescribable” – in many ways. Thank you for helping. Earlene and Mark Girman and entire Family.